"Wow!" - I said to myself after reading R Helps With Employee Churn post - "I can create interactive plots in R?!!! I have to try it out!" T - official tax for waste disposal per unit. E1 - expenditures of the illegal landfill owner for disposal of waste per unit. Lets plot the graphs (with some random numbers (except for fines) for a nice looking representation) to have a clue how it looks like. Note that there is a footnote (this post provides nice examples on how to do it) with the values used for plotting - it is important to have to have this kind of indication if we want to create a series of plots. Now I will show you the result and then will provide the code and some tips. Before I will show you code I want to share my hardly earned knowledge about nuances of the manipulate library. There are several ways to get static plot like that using ggplot, but some of them will fail to be interactive with manipulate. All the data for the plot must be stored in one dataframe. All data for plots must be derived from the dataframe (avoid passing single variables to ggplot). Do not use geom_hline() for the horizontal line - generate values for this line and store them inside dataframe and draw as a regular graph. To create a footnote (to know exactly which parameters were used for the current graph) use arrangeGrob() function from the gridExtra library. ## Ta --- official tax for waste utilisation per tonne or cubic metre. 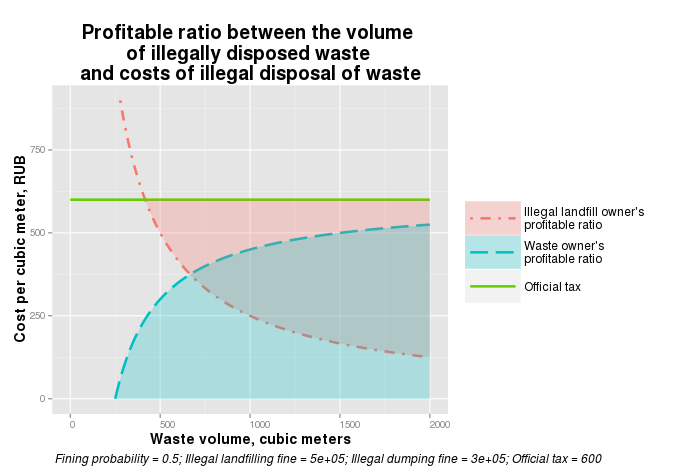 ## k --- probability of getting fined for illegal dumping the waste owner (0<=1). ## P --- maximum fine for the waste owner if he got cought. ## V --- waste wolume (tonns or cubic meters). ## E --- waste owner expenditures for waste utilisation / removal. dta$name[dta$variable=="IlD"] <<- "Illegal landfill owner's\nprofitable ratio"
dta$name[dta$variable=="IlL"] <<- "Waste owner's\nprofitable ratio"
Hello How to make money with HashFlare 2018 https://hashflare.io/r/56BFA7D6 mining Bitcoins https://www.youtube.com/watch?v=Yv8Ws_T7S2I ! !